For the budget-minded, Denver is the perfect spot for an affordable vacation getaway. These free tours take you behind the scenes at several unique Denver attractions. Anyone with even the smallest sweet tooth will love this free tour, which gets you behind the scenes at Hammond&apos;s Candy Factory, a company that has been making candy in Denver since 1920. You&apos;ll come away with a newfound respect for the candy industry, plenty of free samples - and maybe a cavity or two. Get a behind-the-scenes look at Denver&apos;s craft beer world on a free tour at the Great Divide Brewery in Downtown Denver. Tours take place at 3 p.m. and 4 p.m. Monday - Friday and each hour starting at 2 p.m. to 7 p.m. on Saturday and 12 p.m. to 5 p.m. on Sunday. To see where your currency is conceived (sorry, no free handouts), follow the money trail to the Denver U.S. Mint. The free, 45-minute tours are led by knowledgeable guides and provide a fascinating look into the history of coinage. Both kids and adults will love getting up close and personal with the shiny pocket change that streams off the production lines. Tours are available Mon.–Thurs. from 8 a.m. to 3:30 p.m. Same-day tour tickets are available at the Tour Information window, which opens at 7 a.m.; no advance tickets are available. Take a self-guided audio tour right on your smartphone to learn about the history and architecture of Denver. 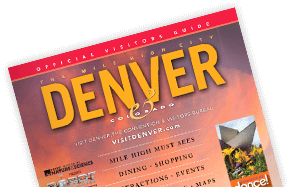 Developed by AARP Colorado, the GPS-led audio tour takes users on 20 points of interest, including the Molly Brown House Museum, Governor’s Mansion, Capitol Hill and Denver Art Museum. To access the tour, download the free Geotourist app on the Apple iTunes and Google Play app stores. The Money Museum offers an opportunity to learn about the Federal Reserve Bank. And, best of all, it&apos;s free! Walk-ins are welcome and groups can make advance reservations. Photo ID required for visitors 18 and older. On your way out, don&apos;t forget to get your bag of shredded money. Tour the magnificent Colorado State Capitol Building. Stand at exactly a mile high on the steps, see Allen True&apos;s beautiful murals, listen in on the Colorado General Assembly, and check out the gorgeous Rose Onyx wainscoting. Free tours are available Monday through Friday.